Learning comes naturally when children are thoroughly engaged. One way to do that is to have them included in the book that they are reading. When they find themselves as part of the story that they reading they become part of the adventure and that book will keep their interest.Studies show that when children are a part of what they read it builds self-esteem, confidence and promotes literacy. 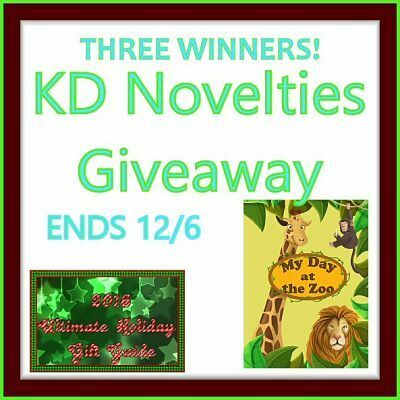 I recently had the pleasure of discovering a great family owned and operated business, KD Novelties, that offers top quality innovative personalized books and gifts that foster a child’s education. I would like to tell you about a book that I took a virtual tour of and stopped by their reading room to check out. In My Day at the Zoo your child and their friends will embark on an educational adventure at the zoo where they learn about the exciting world of animals. By following their map they get to meet the Elephants, Lions, Monkeys and more! With it’s great story, colorful pages, and detailed artwork this book is one of my featured items for the holidays this year. Be sure to stop by and check out My Day at the Zoo and all the other personalized gift items that your little would love to find under the tree this year. Excited about this 2016 Ultimate Holiday Gift Guide Item? Thanks to our wonderful sponsor THREE lucky readers are going to get to put one of these hard cover 9 x 12 personalized children’s books under their tree for FREE! By following us on our social networks and by email we are able to get the best giveaways together on the internet! Please take a minute to follow us!Thanks! If you have any questions or are a brand/company and would like to work with Paula Stewart please contact us here. LOVE GIVEAWAYS?